Indie Film has not progressed very much in 38 years. 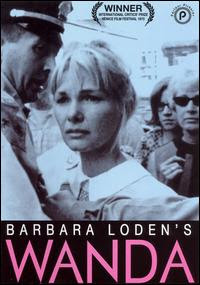 I finally caught up with Barbara Loden's 1970's WANDA last night. It would feel pretty damn fresh today. It ranks up there among the American Indie greats that's for sure, particularly among the great debut features, and the ones that the director also stars in. It made me wish that we had somewhere we could go where we could get an immersive course in Loden's life. If you know, let me know. I couldn't resist a trip to the Mike Douglas Show, co-hosted by John Lennon and Yoko Ono. First off I learned Loden was married to Elia Kazan. The struggles she faced as a female director are as real today as they were then. Except back then you had the most famous creative couple in the world promoting her work. And they were great & daring artists too; there is no equivalent today. John Lennon - Yoko Ono - Barbara Loden Uploaded by CinemaMonAmour. - Full seasons and entire episodes online. There's been a lot of good writing done on the film, including this from driftingclouds and filmmaker Mary Brownstien's piece from HammerToNail. I was really struck by the quality of the performances and Loden's willingness to let the camera linger. You can tell she is working with a tiny crew (4 people evidently) and the level of intimacy she achieves is a marvel. The budget, back in the day, was $115,000. It is required viewing. 8/31/10 Update: The New York Times just reported that WANDA is being restored. Time to rejoice!